With Social Login Pro extension your customers will enjoy registration or login procedure, as it will be completed in a few clicks. Use one social login form to choose from more than 50 social networks! Offer your visitors to login via any of 50+ supported social media networks. Collect verified and reliable customer profile data. Allow your customers to share your site with friends once they have registered. Social login for Magento is the key to your successful and profitable online presence. With this extension, visitors to your store will not have to go through a lengthy procedure of submitting login details. Instead, they will be able to use their social network profile to access your site. The range of social media platforms our extension supports is now over 50, and we keep on adding more social network providers and email systems to meet the needs of all sorts of users, and increase the number of prospective customers. Being totally responsive, our Magento social media login extension will smoothly work on desktop, tablet and mobile devices. Over 50 Social Login Networks Supported! 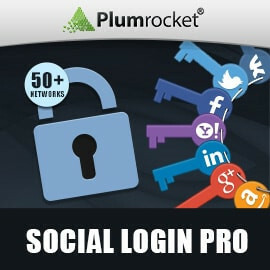 Plumrocket is proud to offer Magento Social Login with 50+ social media networks and services. This module provides more networks than all other third-party social login extensions combined. See the full list of supported networks below. Get the most complete documentation on the web for social login API configuration on the Magento Platform. Create a personal experience across the site from the moment your customer registers and until the purchase is made. Display customer profile photo from the social network next to the "User Account" menu or anywhere else on your website. Aggregate verified and reliable profile data, such as email address, full name, location, birth date, gender, etc. Use this rich profile information to personalize marketing campaigns and launch targeted promotions such as coupons and incentives on the user's birthday or anniversary. Enable social login on customer login and registration form straight from the Magento admin panel. Display social login buttons, social registration buttons and customer photo anywhere on your site using our extensive developers guide and API reference. As a bonus, allow your customers to share your site with their friends after they have successfully registered using Magento social login. Get the Magento Loyalty Program Package from Plumrocket to reward your customers when their friend makes their first purchase using the shared referral link. Reduce cart abandonment rate, increase number of registrations, solve issues with unreliable user data and few return visits by implementing social login at your store. Implement social checkout at your store by letting your customers buy quickly without account registration. Offer a secure way to login without the need to save user passwords at your Magento store. Avoid issues with incorrectly entered email addresses by retrieving verified emails from social network accounts. Magento Social Login Pro was designed to work flawlessly on any third party Magento theme. Whether it is your own custom theme or a popular theme like Ultimo, Shopper, Fortis, etc. – it supports them all. Compatible with the latest Magento Community and Magento Enterprise Editions. Customers can socially share your website after they have successfully registered on your website. If combined with Magento Loyalty Program Package, customers will be able to share referral links and earn rewards when they refer a friend who makes their first purchase. I have noticed that my customers do not like registration process and even I don't like it personally. So, I have started to develop my own facebook login and twitter login, but I have faced a lot of issues during development. Online tutorials are very old and I face difficulties during the development of "my own facebook login and twitter login". After that, I planned to google and landed to plumrocket store and found this extension which exactly suits my requirement. I have installed this extension and noticed the conversion rate which is good. Users are bypassing the register and ready to login using social media Facebook or Twitter. It makes order process flow in a smoother way. I really like this app, as it is simple to use. And support team is also very good. I will recommend them to others too. Please, make more beautiful apps like this! I purchased several extensions from Plumrocket, this being one of them. This extension makes it very convenient for customers to login and checkout. This is one of the 'must-have' extensions! Team keep it up, make more beautiful apps. Got this & my signup rates increased upto 200% . Really liked it. Would recommend this for every Magento store running in 1.9 and above, Their support is awesome. Got this extension & Faced a Little bit issue with it, Team solved it Actively & very quickly. Thanks for the support. Will get more extensions from plumrocket. The extension has huge number of options for social login, and what I really appreciate is that Plumrocket has given configuration instructions for each of them, with screenshots (which I am sure would have taken a lot of pain to compile)! Installation was easy on a modified ultimo - working straight out of the box! I've searched more than one site for a similar extension, but I finally settled on this because of price and valuation. It's very convenient for customers and it doesn't take much time to activate. The most effective addon for our magento store. It supports so many different social networks which is really impressive! I also like an option which makes it possible to see the customer's social accounts and search by them from an admin panel. I would also like to admit that support manager Anastasia is very helpful and always answers all my questions. Works great and easy setup! Plumrocket has a great walk through for setting up the plugin and importantly for setting up the social API connections which are complex. It works great and has lots of options. Recommended to increase customer account creation! Great module has all social media networks!!! We are very happy with this module, because it offers us tons of social network logins especially the most needy ones for our market. Works greatly haven't had any issues or collision with other modules. Definitely recommend if you want to gain clients and make your website more accessible. Thanks Plumrocket we love your products!!! We were looking for a social login plugin that worked seamlessly with our custom theme. Plumrocket Extension and their team were able to make it work. I appreciate the professionalism and attention to detail the technical team has shown thru this experience and would definitely leverage the team as a goto organization for our future needs. It connects to many social networks, and login is fast. The configuration requires calm because you must have an account in each of the providers ... gmail..Hotmail..etc. But in the end it's worth it. The extension installed easily without issue. we noticed a few little problems related to our database specifics, but tech support fixed that for us almost straight away. Support for a large number of socialized logins. Plumrocket made it possible for us to support a large number of socialized logins at our store via this plugin. Once we have them set up - our customers will surely benefit from quick way to login. We had a small issue with one social media portal, the developer's went way out of their way to help fix it for us. Very impressive! Thanks guys! It increase customer retention rate. We have notice a growth of number of leads who have login in our database. Very wonderful extension. this extension supports new social networks: Alipay, WeChat, they are good for me. Easy and simple. It is displayed on both login and checkout page so customers have more chance to register or login. Happy with this extension! I recommend this extension,good performance and warm help! The plugin is including all the platforms I needed. It's easy to activate and customize. The documentation online is really useful. Also, I had a question to support about Twitter (we couldn't get user email from twitter connect). They checked my need and replied to me really quickly. I was really looking for a extension which can be displayed user photo and name in the header. I never saw the extension which has this features. Strongly recommend this extension using with their Popup Login Extension. The extension is very useful and allows to access with just a single click. Thank you for your positive feedback, it is highly appreciated! Indeed, it may happen that some social networks do not return all the needed data required for registration/login (example is Twitter network - their policy restricts sharing email address with third parties). In this case our social login extension steps up - it will let your customer login or register, and will substitute the missing data from customer with a temporary one. Then it will prompt the customer to indicate the correct information about his account! We hope this information will be useful for those store owners looking to increase their customers database! I was looking for an extension that in one place I can have Facebook and vk login ( Russian Facebook ). We have multi store website, works perfectly for us. Highly recommend this module ! Replaced Google+ with Google and it doesn’t return date of birth and gender data. Added callbackurl field on the storeviews. Fixed issue with an opportunity to choose CMS pages that are disabled for Login Success Page and Registration Success Page configuration options. Fixed issue with statistics UI. Fixed bug with impossibility to login if "Require Emails Confirmation" option was not enabled in the backend. Now after registration user's default status is changed to "Confirmed"